We are having so much fun making all of our Christmas treats this year, but my son’s favorite treat hands down has actually been the easiest to make! 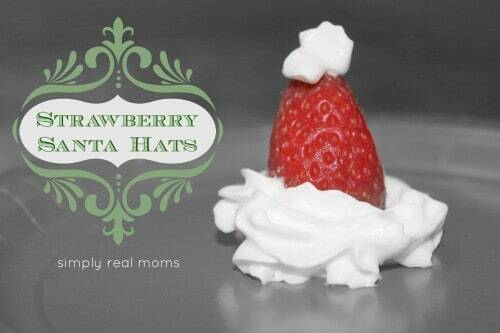 These adorable Santa Hats made with strawberries make the perfect kid friendly treat they can make for a party or even for Christmas breakfast! You need strawberries with the stems cut off, and whipped cream! Simply squirt a little whipped cream onto a plate and place a strawberry on top, adding a little whipped cream onto the sides if needed. Then, top it off with another little bit of whipped cream! Easy to make, but the kids all love it! Another variation would be to dip the bottoms in white chocolate or white melting candy. Enjoy this, along with all of the rest of our holiday treats this Christmas season.